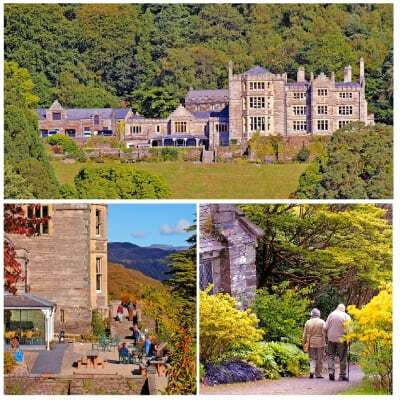 Discover the beautiful gardens of Plas Tan y Bwlch, a spectacular Victorian garden nestled in dramatic mountain scenery within the Snowdonia National Park. Covering 13 acres, this garden for all seasons hosts a variety of rhododendrons and azaleas in spring, including a 120-year-old rhododendron tunnel. In summer the flowers of the South-facing sunny borders are a delight and autumn leaf-colours are not to be missed. Visitors also have the opportunity to view parts of the garden undergoing a fascinating restoration following extensive storm damage in February 2014. Overlooking the garden is a dramatic Victorian-Gothic mansion that was once home to wealthy slate quarry owners the Oakeley family. Now run as the Snowdonia National Park Authority's study centre, it is possible for groups to look inside this historic building. The Dwyryd Tea Room offers selections of tea, coffee, light lunches and homemade cakes (which are simply delicious), as well as stunning views across nearby mountains, rivers and Maentwrog village.